When Chevrolet offered me a chance to test drive their brand new electric car, the Chevy Volt, several months ago I jumped at the chance. After all, I have been following the growing momentum of consumer electric cars with avid interest over the past few years, and I’m beside myself with excitement about all the new mass-market electric cars that continue to be released. It’s clearly a sign that consumers are finally ready for electric vehicles. Between the Nissan Leaf, Coda Sedan and Chevy Volt (all of which are supposed to be released this month), only the Volt has a hybrid gas-electric engine system which provides a gas engine-extended range of 300 miles to prevent drivers from being stuck without a charge. This means that ‘Range Anxiety‘ — the main concern that many drivers have about electric vehicles — is allayed with the back-up gas-powered engine in the Volt. Basically, the Volt can drive further without a fill-up than most gas-guzzler cars, so you’ll never need to worry about being stuck somewhere on the side of the road with an empty battery. Like many standard electric vehicles, both the Nissan Leaf and Coda Sedan get about 100 miles per charge, but the Chevy Volt gets 340 miles on a single charge (with the backup gas tank). It is also about $7,000 more expensive than the Leaf ($41K versus the Leaf’s $33K), but my bet is that consumers will be willing to pay more to cure range anxiety. 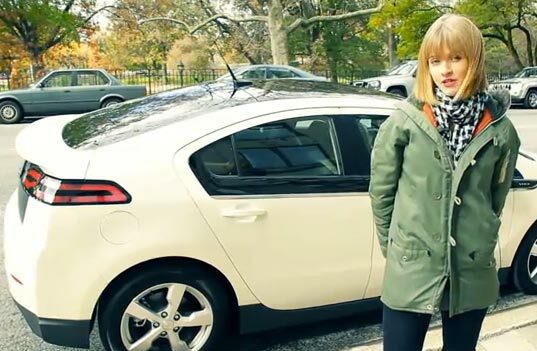 How is the Volt different from a hybrid vehicle like the Prius? In case you are wondering ‘How is this any different from a hybrid vehicle like the Prius’ – the Volt is a pure electric vehicle, meaning the its engine is an electric engine, not a hybrid gas/electric engine. In the Prius and other similar hybrid cars, there are two parallel engines (one gas, one electric) which work together: the small electric engine provides power for low-speed driving and a regular gas engine provides the power for acceleration and faster-speed driving. 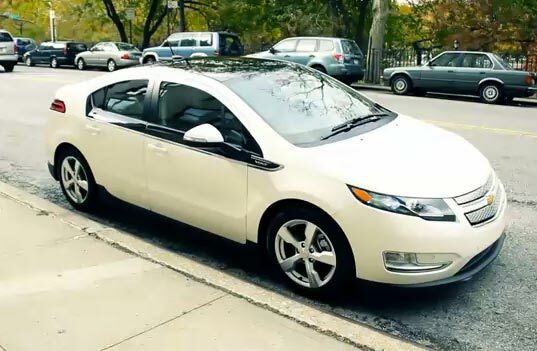 In the Volt, only the electric engine powers the car at all times, and the backup gasoline engine acts merely as a generator to provide electricity to keep the battery in a steady state of charge after 40 miles. Slightly complex, perhaps, but this is a big issue to GM – they don’t want anyone calling the Volt a ‘hybrid’. So how did the Volt drive, you ask? I really enjoyed it. It was very smooth, quiet, and accelerated quickly. I’ll be honest and say that because I live in Manhattan I don’t drive every day, but the years I spent growing up in California have given me plenty of experience with cars. The Volt definitely tops anything I’ve driven recently, and seems perfect for city driving or commuter driving. The only issue is that it is so quiet that pedestrians and bikers don’t hear it coming. I experienced this first hand on my test drive in New York City, when a bicyclist flew out of nowhere in front of my car and then seemed surprised that I was there. Fortunately, Chevrolet has planned around this and designed a warning noise for bicyclists and pedestrians that you can hit on your steering wheel. I think that perhaps the noise should be designed into the vehicle to be more automatic, like when breaking or accelerating. All-in-all, however, the Volt was a great ride, and I’d buy one if I was in the market for a car! Until then, I’ll cross my fingers that Zipcar and Hertz start adding Volts to their fleets. "In the Volt, only the electric engine powers the car at all times, and the backup gasoline engine acts merely as a generator to provide electricity to keep the battery in a steady state of charge after 40 miles" Nope, that is wrong. The gasoline engine can also drive the wheels directly. Shame that even engadget managed to test-drive it before inhabitat - which makes no sense at all! Timon, considering they have the slowest traffic in the States at least your not idling in one, technically speaking. Good looking machine though. I thought no one drove in New York? Can't wait till they come out in the UK. The range is going to be a huge selling point for them for sure, as well as it being grouped as an electric, not a hybrid car. Sweet video! Will someone please get me one of these for Christmas? this actually makes me miss driving! This is awesome. I've been waiting for this to come out for so long and it looks like they nailed it. At last an American car company leading innovation! A warning noise for bicyclists and pedestrians because the volt is "too quiet" -- I like this kind of reduction in noise pollution! Talk about an all-around automobile addressing various polluters that affect us each day. Great video! I think we should get one of these and put the Inhabitat logo on the side - Inhabivolt. When Chevrolet offered me a chance to test drive their brand new electric car, the Chevy Volt, several months ago I jumped at the chance. After all, I have been following the growing momentum of consumer electric cars with avid interest over the past few years, and I'm beside myself with excitement about all the new mass-market electric cars that continue to be released. It's clearly a sign that consumers are finally ready for electric vehicles. Between the Nissan Leaf, Coda Sedan and Chevy Volt (all of which are supposed to be released this month), only the Volt has a hybrid gas-electric engine system which provides a gas engine-extended range of 300 miles to prevent drivers from being stuck without a charge. This means that 'Range Anxiety' -- the main concern that many drivers have about electric vehicles -- is allayed with the back-up gas-powered engine in the Volt. Basically, the Volt can drive further without a fill-up than most gas-guzzler cars, so you'll never need to worry about being stuck somewhere on the side of the road with an empty battery.